This is a dual language picture book with text in both English and Arabic. In lyrical language, it tells the story of Rama and her family who are forced to leave behind everything they know and love - to search for a new home in a place where bombs do not fall. Carrying their belongings on their backs, their journey is painful and difficult, especially for the children. Thoughts of a better life help them persevere. And then they reach their future. Nizar Ali Badr is a Syrian artist. He composes images using rocks, and takes photographs of them. This makes the illustrations unusual and striking. It also makes them perfectly suited to a book that makes us think about the land, and the places we call home. Children will be amazed at how much an artist and sculptor can say through rocks. I loved the variety of colours and shapes, and how eloquently they spoke to me. Every public and school library will want this book. It’s so important for us to try to understand the plight of people whose countries have been torn apart by war. 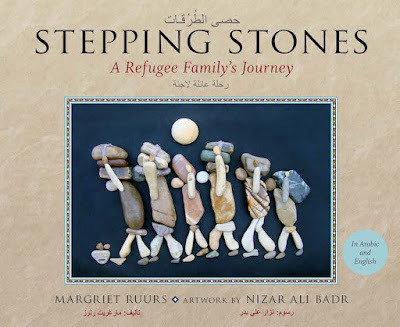 Stepping Stones allows us to enter into the feelings and experiences of a young refugee girl, and by so doing, get an idea of her past and her future. It’s a moving story, and one that I hope touches many hearts. There are Australian Curriculum aligned Teacher Notes available via UQP’s website. A wonderful,much-needed book. I feel strongly that the only way we can bring about a more compassionate and harmonious world is by teaching our children to understand. Thanks for your thoughtful comment, Carol. I agree wholeheartedly and love that children's literature is one way to help kids understand.